I love staying in hotels but there are times when one gets bored of the same vanilla styling. That’s where the five-star Royal Rose Hotel comes in. Boasting 19 floors and 355 rooms, this opulent hotel is designed in European Baroque style. The meticulously sculpted regal outer façade is coupled with lavish interiors that will be sure to impress you. As one enters through the glass doors, one would be forgiven for thinking that one had walked into a French palace. A massive chandelier overlooks the gold and red lobby with the winding staircase. Ornate marble pillars with intricate gold-leaf designs support the lofty ceiling. Oil paintings adorn the walls of the public areas and the rooms. As it was December, festive decorations hung in the lobby too. The only hint that one was in the Middle East was the welcoming gold trolley with dates and Arabic coffee. Opened in 2013, the family-friendly Royal Rose Hotel is part of the popular City Seasons Hotel Group and their first five-star offering. Located in the Al Markaziyah District, it is within walking distance of the business hub, government institutions, restaurants and shopping centres. The Abu Dhabi Corniche and other Abu Dhabi attractions, like the Sheikh Zayed Grand Mosque and The Louvre Abu Dhabi, can be easily reached by taxi. Even though we arrived at the hotel well before the official check-in time, and the hotel was quite busy, our rooms were ready and waiting for us. We had two inter-leading bedrooms, a Grand Deluxe Double Room and a Deluxe Twin Room. Both featured comfortable beds, seating areas and working desks. The connecting doors between the rooms were kept open most of the time, effectively creating a spacious family apartment for us and our children. 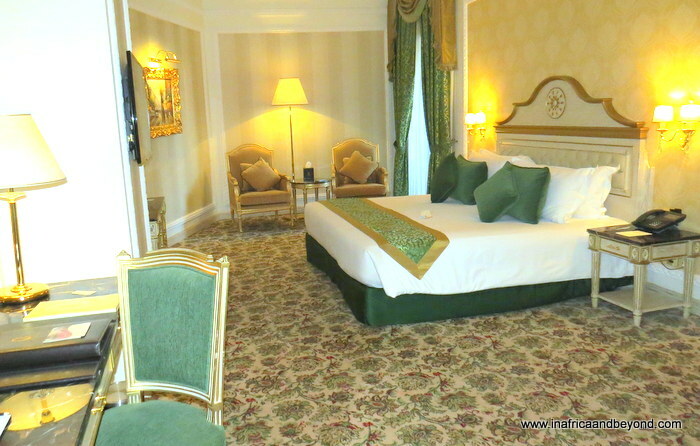 The rooms were decorated in green and gold shades, and the floral carpets, wallpaper and elaborate furniture continued to make us feel as though we were in a royal chateau. At the same time, it was not lacking in modern comforts and conveniences. Interactive satellite televisions displayed welcome messages for us. Complimentary wireless internet access, iPhone/iPad docking stations and mini-bars were all provided. The bathrooms had bath tubs and separate showers. Luxurious amenities and additional thoughtful items like toothbrushes and razors as well as plush bathrobes and slippers were also provided. There are two elegant restaurants and a lounge where one can order drinks and light meals. The deep red and gold Printania Restaurant offers all day buffet-style dining. Arabic and international specialties are prepared at live cooking stations in addition to the buffet offerings. Barocco Restaurant specializes in gourmet European cuisine. 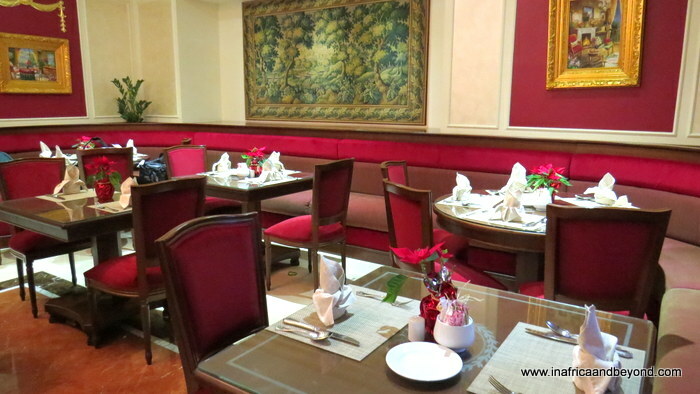 The Brasserie overlooks the lobby and serves specialty teas, coffees, cakes and snacks. We had a huge breakfast at Printania on both mornings. Dishes included noodles, fried rice, vegetables, eggs, meats and pastries. Royal Rose is a dry hotel, which means that no alcohol is served here. For us, this was great as it added to the hotel’s family-friendliness. 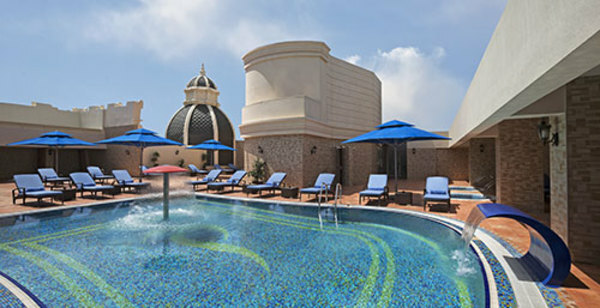 A large swimming pool and a jacuzzi can be found on the rooftop. Alba Spa offers a variety of treatments, with separate sections for men and women. There is a well-equipped fitness centre too. The helpful Concierge desk will assist you with transport arrangements and other services while the travel desk at the front will organize desert safaris, city tours and other activities. We did a city tour and a desert safari and enjoyed both. 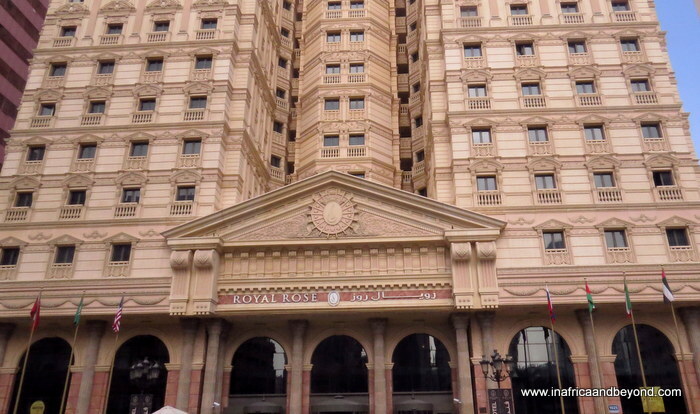 The Royal Rose Hotel is a sensual urban sanctuary with French inspired bling. It is beautiful inside and outside, and a great place to stay if you are looking for five-star luxury with a difference. For more information, visit Royal Rose Hotel or book here. 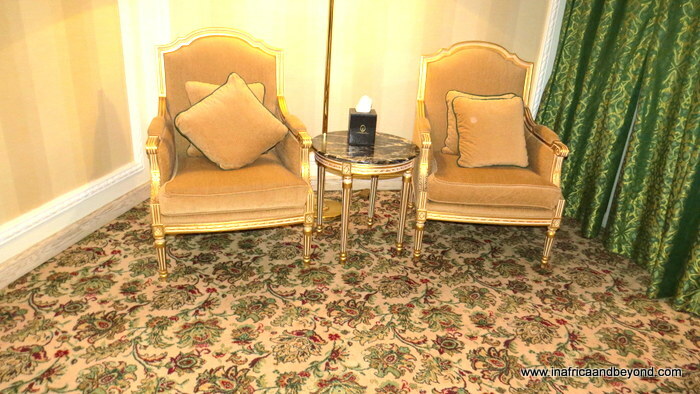 Note: Featured image above is of the Royal Suite. 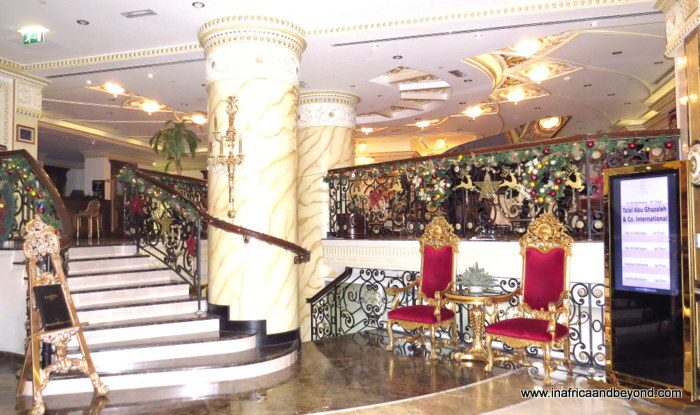 I lived in Abudhabi, so I went to Royal Rose hotel for dinner but never stayed there. I agree with you, regarding the architectural style of hotel as it is influenced by European style of buildings. Also its central location, make it a favorable place to stay in Abu dhabi. I quite love the interiors of the hotel and I did not know that there’s a hotel in Abu Dhabi with its architecture done in the European Baroque style. I live in the UAE and have been to Abu Dhabi several times but never spent the night there so I don’t know a lot of the hotels there (except the famous ones like Emirates Palace). Royal Rose Hotel looks pretty cool too! United Arab Emirates has some of the finest hotels in the world. Royal Rose Hotel looks great! I like the minimalist décor of the rooms. The suite looks grand. My favourite place is the pool. Wow what a treat 🙂 Royal Rose Hotel looks fabulous! I am with you that some hotels can be boring with their designs especially the big names, and I also love stay in unique places. I love the details here especially the chairs! I cant wait to visit Abu Dhabi! Its so much to see there and now I also know they have an amazing places to stay! WOW! Luxury redefined right. It is a lot of bling, but I love how open and grand it is and being in the Middle East how very gold it is. The exteriors are quite palatial like, must be so cool staying there. Wow, all I see is gold everywhere. I LOVE Gold haha. I absolutely love the decor and will def love to stay here when I visit. Because I do plan on visiting Abu Dhabi in the near future, Thanks for sharing! The rooms somehow reminds us of the Burj Al Arab haha, it’s quite kitsch! It’s not usually our type of decor, but once in a while it is indeed good! Really like the room from the hotels’ photo though with the pink/pruple decor. I guess that’s a premium suite though! I will definitely put in on my list for my next visit to Abu Dhabi.